Western blot analysis of extracts from MDA-MB-435, Hep G2, and PANC-1 cells using β-Arrestin 1 (D8O3J) Rabbit mAb. Western blot analysis of extracts from A549 cells, vehicle-treated (-) or treated with dexamethasone (100 nM, 24 h; +), using β-Arrestin 1 (D8O3J) Rabbit mAb (upper) and β-Actin (D6A8) Rabbit mAb #8457 (lower). 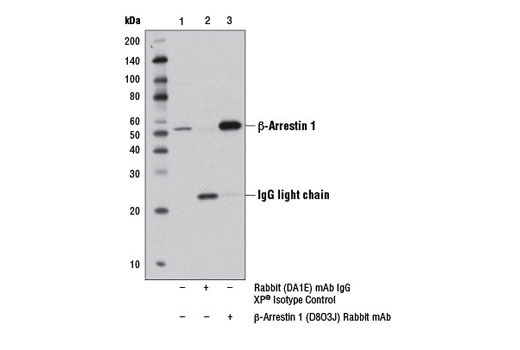 Immunoprecipitation of β-Arrestin 1 protein from LN18 cell extracts, using Rabbit (DA1E) mAb IgG XP® Isotype Control #3900 (lane 2) or β-Arrestin 1 (D8O3J) Rabbit mAb (lane 3). Lane 1 is 10% input. 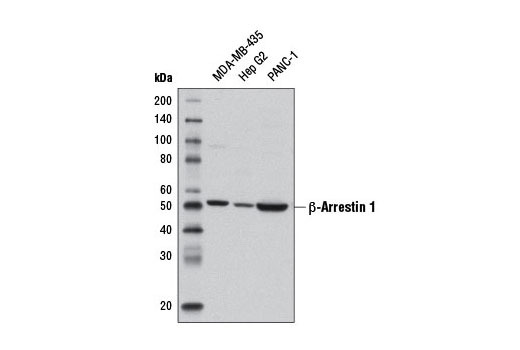 Western blot analysis was performed using β-Arrestin 1 (D8O3J) Rabbit mAb. β-arrestin 1 (D8O3J) Rabbit mAb recognizes endogenous levels of total β-arrestin 1 protein. 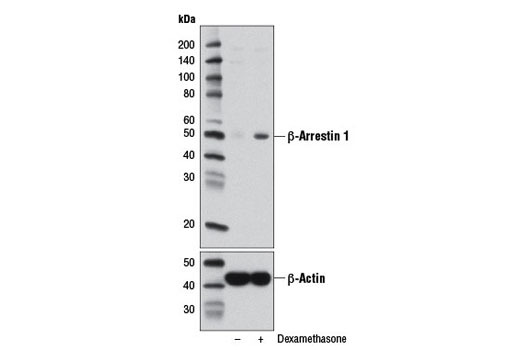 This antibody does not cross-react with β-arrestin 2. Monoclonal antibody is produced by immunizing animals with a synthetic peptide corresponding to residues near the carboxy terminus of human β-arrestin 1 protein. A research study has shown that non-visual β-arrestins respond to glucocorticoid signaling, with differential responses observed among family members. Specifically, β-arrestin 1 expression is increased in response to glucocorticoid receptor activation whereas β-arrestin 2 shows a concomitant decrease in expression (11). Oakley, R.H. et al. (2012) Proc Natl Acad Sci U S A 109, 17591-6.